Planting for beautiful fall colors! 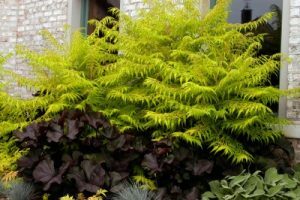 Planting in the spring and living in the moment of buying plants we can sometimes overlook the plants that aren’t blooming or the foliage that doesn’t catch our eye yet. We can help you look ahead into the fall (summer isn’t over yet!) and pick out some plants that are fall blooming and/or have fall foliage color. 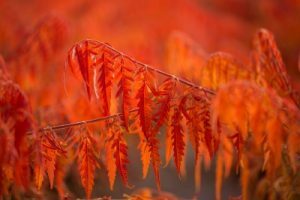 Here are a few examples of plants that have pleasant fall colors you can plant now if you want to keep the colors going to the end of the season. 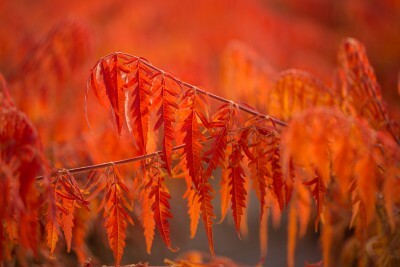 This sumac grows about 6′ wide and 6′ tall and the foliage is beautiful all season long! The foliage is a brilliant chartreuse green during the summer but it also keeps giving beautiful color into the fall when it’s leaves turns orange, yellow, and scarlet color. This plant definitely has an oriental look to it! It’s drought resistant, can take full sun, and is a zone 4 so it will survive the winters here! Spirea is a flowering shrub that works well for your border plantings and provides spring blossoms as well as great fall foliage. 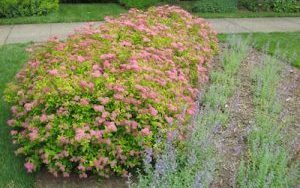 Some spirea varieties can also bloom spring and fall. The two spirea that came to our staff’s mind for fall foliage is the Magic Carpet Spirea (See image on the right ) that turns a rich russet red in the fall after it’s summer season mature bright gold foliage or the Tor Birchleaf Spirea that turns gold, red, and purple in the fall. The Tor Birchleaf grows in compacted mounds and is deer resistant, fragrant, and attracts butterflies. The Magic Carpet grows full and bushy, is an early bloomer, and has brightest colors in full sun. Planting them en masse and paired with other perennials would create a more dramatic effect in your landscape. Ask us about which varieties can be pruned after first flowering to try for continued blooming into fall. Some might not think of this succulent perennial right away when recommending fall blooming perennials but this plant is a “set and forget” type of plant. Not to say these plants need no watering in very dry weather but this is one rugged plant with many varieties! 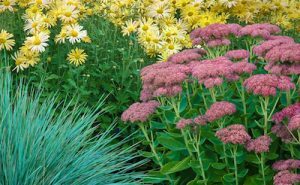 The Sedum named Autumn Joy (See first image of the rosy pink flowers with yellow mums behind them) is one that surely is going set the tone for autumn with it’s late summer/fall blooming flowers turning from rosy pink to a russet red as fall arrives. Use the sedum flowers for fresh fall flower arrangements! Check out this blog post of some lovely bouquets, table centers, etc. using sedum as a filler. If you like to feed the birds, fall birds like finches and chickadees like the seed heads. 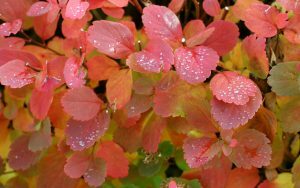 In addition to Autumn Joy there is Autumn Charm where pink bud heads turn into a brick red as fall continues and Autumn Fire Stonecrop that is planted in our perennial garden area that is known for its longer lasting flowers and studier stalks. 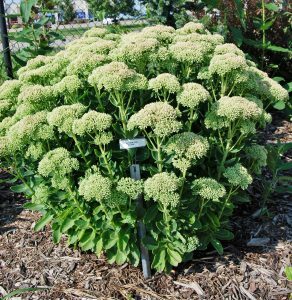 For a bushier plant, prune your sedum in early spring about an inch above the ground before new growth. There are many other trees, shrubs, perennials, and annuals ( like Chrysanthemums that will be ready for purchase towards the end of August!) that can provide you extended seasonal color and attraction in your landscape or garden. The garden is an ever evolving thing so when you have time to take tabs on when things are blooming or changing color why not add more plants for fall color?